A salt is an ionic compound formed when the hydrogen of an acid is partly or completely replaced by a metal ion or ammonium ion. All salts are chemically and electrically neutral. 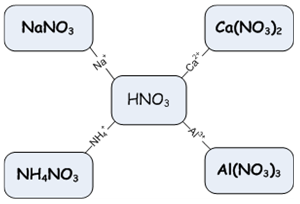 Diagram above shows that when the hydrogen ion in nitric acid is replaced by Na+, Ca2+, NH4+ or Al3+ ions, salts are formed. State whether the following chemical are salt or not salt..
Barium nitrate, zinc sulphate and tin nitrate are salts. Aluminium oxide, carbon dioxide, glucose and ethanol are not salts. Solubility is the ability of a compound to dissolve in a solvent. Table below shows the solubility of the salts of nitrate, sulphate, chloride and carbonate. Lead halide such as lead(II) chloride (PbCl2), lead(II) bromide (PbBr2) and lead (II) iodide (PbI2) are insoluble in cold water but soluble in hot water. Oxide Mostly insoluble in water except: K2O and Na2O.